that the Almighty imparted unto Jesus. 1 Precious Seekers for Your Own Freedom. 2 Know that the full Power of the three-times-three is the mighty momentum of the stream of Love that issues from God's heart! 3 Filling the universe with abundant joy, 4 it flows forth into thine own heart. 5 This is the cosmic fount of pure Love that springs up as the crowning radiance of each manifestation in nature, 6 in the angelic hosts, 7 and in man. 8 It is to this Love of God that we must pay tribute whenever we drink in the floral fragrances 9 of the blossoms of natural beauty nodding in the sunlight and the gentle wind. 10 This Love is also the motivating Power behind all angelic action. 11 Therefore, those who would draw very close to the angelic hosts, 12 that they might receive their protection, 13 radiance, and blessing, 14 will be most wise to keep harmonious at all times and to shun all forms of human discord. 16 What greater service can be rendered unto life than simply to manifest Love? 17 Remember, true Love is the great magnet that draws forth the Power of God's heart charged with his holy Wisdom. 18 The secret of the evocation of Power, then, really lies within the heart of Love. 19 It must be acknowledged here that men and women of the first ray1 who so successfully invoke Power 20 do so by turning to the great Power of Love and drawing therefrom the Power of God. 21 Unfortunately, some among our readers out of sheer ignorance, 22 and sometimes bigotry, look to find a flaw in our teaching and our released concepts. 23 Now, the human mind can be very tricky and stubborn. 24 If individuals determine that they are going to find a flaw or contradiction in our words, 25 be assured that they will. 26 Then, too, the sleuths inspecting for fallacy in the Logos itself2 27 can always find a false answer or wrong conclusion by the same systems of human logic 28 which at their bidding will support or justify their own ends according to the premise taken. 29 I regret that such as these are moved by their vacuums of self-knowledge 30 and a desire for self-righteousness, 31 but I cannot be moved to undue concern for them. 32 One day they will humbly seek Truth. 33 However, I am concerned for the sincere and would therefore mention the law of relationships involved in the polarizations of the human consciousness 34 as opposed to the law of the divine polarity inherent within every attribute, 35 or 'be-attitude', of the Godhead. 36 Some of you are aware that the study of the relationship of opposites in the planes of relativity is reflected in the dialectic of the nineteenth-century German philosopher Georg Hegel, 37 who theorized that man's thought process and all historical change result from the interplay of three elements: thesis, antithesis, and synthesis. 38 According to this observer of life's forces, 39 every thesis generates its opposite, or antithesis, 40 and the interaction of the two produces a synthesis which transcends both. 41 The emerging synthesis in turn becomes a new thesis 42 and the entire process is repeated again and again. 43 Thus, in the Hegelian dialectic all progress is brought about through the inevitable conflict of opposing forces 44 a principle Karl Marx turned upside down in his ''dialectical materialism,'' 45 wherein he replaced Hegel's idealism with economic materialism. 46 Whereas Hegel supported the value of the state and saw in the dialectical process the unfoldment of spiritual principle, 47 Marx branded the state a mechanism of exploitation and claimed that all progress arises from conflicts involving the economic means of production. 48 You who understand the premise of the Ascended Masters' teachings to be the Law of the One 49 do not always take into account this law of relativity governing relative good and evil, 50 perceived by psychologists, scientists and the worldly philosophers. 51 Moreover, in the world of maya, where good and evil are always 'relatively' in opposition, 52 we must also reckon with the negative misqualification of the Absolutes of Power, Wisdom and Love 53 upon which we have been discoursing. 54 Therefore we would touch upon both the human and the divine equations. 55 The Law of the One, based on the unity of Being, 56 also functions within the framework of human reason and human events 57 and when it comes full circle in the individual's experience supports Truth and exposes error. 58 But in the human 'two-eyed' perception of the world acquired after the departure from the Edenic self-knowledge in and as the One 59 when the world view of man and woman was no longer single in the immaculate all-seeing eye of God 60 but the same as that of the band of seducing fallen angels called serpents 61 there were unalterably two sides to every human equation, with the pendulum swing hot/cold, left/right, always just waiting to happen. 62 Not so in the divine equation. 63 Here the true Divine Polarity of Alpha and Omega, 64 the plus/minus of the Godhead, and of each member of the Trinity are the Masculine/Feminine counterparts of Being. 65 These are complementary, not opposing, always fulfilling the Law of the One as the Divine Whole. 66 But in the human condition, 67 just as there is a positive pole, 68 so there is a negative pole to a given situation. 69 These are opposing forces, rivalrous in nature and mutually destructive. 70 For example, if the thesis be human love, its antithesis will be some form of love's polar opposite 71 human hatred, fear, suspicion or even mild dislike. 72 Their synthesis will be a watered-down version of both with no commitment either to one or the other. Fig. 24.1: The Divine Equation. 74 And this is precisely why the economic evolution of mankind according to Marx and Lenin can never lead to the divine conclusion: 75 self-transcendence according to the Law of Love, 76 the Law of the One which self-contains the true Trinity 77 Power, Wisdom and Love 78 as the triad of every man and woman's being. 79 Apart from the double-minded who are unstable in all their ways, (James 1:8) 80 divine Truth stands still as a Sun of Love to melt the most brittle human concepts 81 and to unveil the Law of the One! 82 Now hear the word of the Lord. 83 In the original premise of the Godhead, Power, or the will to be, is the thesis. 84 Wisdom is the antithesis and Love is the synthesis. 85 As Wisdom magnetizes the intelligence inherent in the Power of God, 86 drawing it out into the Word of all ideation now expressed, 87 the twain become One, 88 displaying the glorious revolution of Love as the grand synthesis of Power and Wisdom. 89 Love as the consummation of the essence of Power/Wisdom then becomes the new thesis which embodies the fullest realization of Itself 90 in the Work of the Lord 91 incarnating the Three-in-One in every manifest-action! 92 This true synthesis of the Divine Attributes reveals that Love, Wisdom and Power are in reality the One indivisible/individed Whole which can never be divided or divisive 93 their atoms chanting as they chart the spheres: "We are One, We are One, We Are One..."
94 But this is not all. 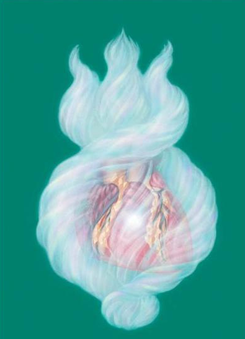 95 The cosmic white fire of the Universal Mother now enters. 96 Born out of the unity of the Divine Triad, 97 She whom I like to call the "Luminous One" steps forth out of her latency in the fiery nucleus of the threefold flame to become the antithesis, 98 or divine polarity, 99 of this thesis of the Trinity. Fig. 24.2: The Cosmic White Fire, "Luminous One" . 100 And out of this union there is produced the synthesis of many manifestations of the Whole 101 sons and daughters of God, 102 each one a new premise embodying the Fourfold Attributes, Father, Son, Holy Spirit, and Mother! 103 Each Self-expression of the Whole uniquely synthesizing their qualities by ultimate free will in freedom's flame 104 not by some damnable inevitability of historical or economic forces successively enslaving the race, 105 but by Union in the Law of the One 106 and then the Three, girded by the Fourth, the Blessed Mother. 107 She manifesting her complementary nature as the Shakti of each Person of the Trinity, 108 releasing out of the white lily center of each plume, 109 from the masculine (+) polarity of Power, Wisdom and Love, 110 the feminine (-) manifestation in the worlds of form. 114 And no other foundations or false premises or synthetic conclusions can be laid, 115 for Man as the offspring of the Highest contains the original thesis, antithesis and synthesis as the trilogy of the threefold flame within his heart. 116 He is also child-man of the Mother, 117 containing her seed-atom and her sacred fire within himself. 118 And none other can displace this fourfold foundation of his Being 119 unless he himself succumb by choice to the lie and the liars who lead the pack of the international capitalist/communist conspirators 120 spawning their pseudo-metaphysical cults of materialism and the dialectic on planet earth. 121 Now let us see how Love is in Truth defined by the Divine Lovers. 122 The path of fiery Love, which is God's all-consuming sacred fire, 123 consumes even the force of Anti-Love, 124 the Absolute Evil of reprobate angels against the Godhead. 125 for Divine Love is more than Love 126 it is Power and Wisdom self-contained all in One 127 and then some. 128 And herein lies Love's mystery. 129 Love is more than effect or lesser causation. 130 it is First Cause and the point of Light beyond all light and darkness. 131 Love is all Love excelling beyond Love's visible expressions 132 and interchanges. 133 Love is the unbeatable cosmic force! 134 True Love, divine Love, in its very magic can still be known by twin flames dwelling in the twilight zone of adulterated love. 135 For Love is always pure and does not contain within itself any self-polluting, self-mutilating force such as fear of failure, 136 fear of Truth, 137 fear of Life, fear to be Love. 138 No interplays or power plays of human psychology can mar true Love, 139 but these can and do mar human love in incubation waiting, 140 tending the flocks of consciousness 141 until the angel of the Lord should trouble the waters of the mind and raise a single drop to the Sun 142 whereby the whole fabric of human love surrenders in the embrace of the Divine. 143 True Love is always understanding, 144 yet not necessarily always understood. 145 It speaks with the Shepherd's voice of authority, never the petty tyrant: 146 it chastens, peeling away by its caressing flames the layers of self-deception of child-man. 147 Love as discipline has the hardness of the diamond-shining Mind of God that alone can bind the tyrant ego and set the captive free. 148 From Christ's heart of true Love, then, 149 the words "Father, forgive them; for they know not what they do" (Luke 23:24) are easily uttered. 150 Love has no imitators, for God alone is Love. 151 You see, in the human sense of love there is love's thesis and antithesis self-contained. 152 Thus, humanly speaking, that which has the capacity for human love also has the capacity for human hatred. 153 And this is precisely the source of life's tragicomedy. 154 But the Divine is not so. 155 In the Absolute 156 where self-disintegration is not, 157 where the law of human synthesis does not neutralize the plus and minus of the divine magnet 158 the attributes of God's Power, Wisdom and Love are always personified in the polarity of 159 twin flames representing the Divine Whole of the Father-Mother God. 24.3 The Trinity in Hindu Tradition: Brahma. Vishnu and Shiva and their relative partners. 160 In the Hindu tradition these divine incarnations of the male and female Principles of each plume of the Trinity 161 are given names and are cherished as emanations of the Deity. 162 In this relationship of the Divine Absolutes, 163 Father is thesis. 164 Mother is antithesis, 165 and the whole of their creation, 166 including the fruit of their Christ Consciousness, 167 is the synthesis their reason for Being and for being the Divine Incarnation. 168 What happens when the Divine Lovers meet in the Divine Embrace of the T'ai Chi 169 the Great Causal Body of God is their net contribution to Cosmos. 170 So it is when twin flames return to the white fire ovoid of their Origin. 171 Only in this ultimate Union (the celebration of the Holy Communion of Alpha and Omega) 172 can the creative purpose of their Being be fully realized. 175 In the Hindu view Brahma as Father-figure, 176 the First Person of the Trinity, 177 is described as the Immense Being 178 the Creator, Supreme Ruler, Lawgiver, Sustainer, and Source of All Knowledge 179 while Sarasvati represents eloquence, 180 the Mother who articulates the Wisdom of the Law. Fig. 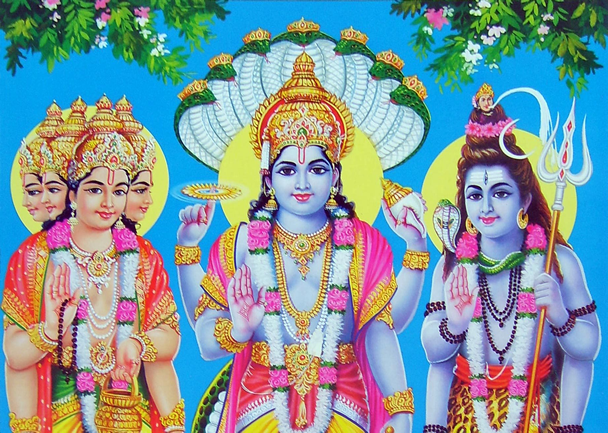 24.3: Vishnu(Son), Brahma(God) and Shiva (Holy Ghost). 181 She is Mother/Teacher to those who love the Law as God's will revealed by Brahma. 182 Thus she is the Power of volition, 183 the will and motivation to be the Law in action, 184 the Source, 185 the river and the riverbed, 186 for the flow of universal knowledge as appreciation for the Law of the Creator 187 self-contained in every particle of the creation. 188 Likewise, the pair in polarity who comprise the Law of the One in the attribute of Wisdom are known and loved as real personalities 189 Vishnu and Lakshmi, embracing the circle of qualities attributed to one or the other, 190 yet lovingly shared and divinely surrendered in the whirling sphere of their Oneness. 191 Thus, in heaven two equals One individed Whole; 192 on earth two in one often sacrifice their true identity to the human synthesis 193 which becomes the new thesis 194 the distinction of the two parts of the original premise neutralized in the moving stream of relativity. 195 For you see, relativity has no fixed polarity. 196 And therein lies its mutability. 197 But above in the shining splendor of the Sun, 198 Vishnu, the immortal Son, 199 stands the embodiment of Cosmic Christ Wisdom, 200 whose essence is duration, 201 the enduring quality, the very continuity of the consciousness of God. 202 He is cohesiveness personified, 203 bonding by Wisdom's Love the cosmic forces conceived in the Universal Mind; 204 his way is liberation by Self-knowledge in the Highest God Self. 205 Vishnu, whose more famous incarnations have been Rama and Krishna, 206 always Hari4 in manifestation, is the all-pervading Protector 207 protecting, by God-awareness of the anti-Self (and then the annihilation thereof) 208 that would steal that True Self before it is born in his little ones. 209 This Second Person of the Trinity is the Preserver of the divine design conceived in Wisdom's flame out of Power's lawful Presence. 210 He is the Restorer of the universe by Wisdom's all-healing Light, 211 the true Power of illumination's alchemy of Love. 216 She bears a cornucopia of good fortune by the 'eye-magic' of the all-seeing eye of her Beloved. 217 She teaches the mastery of karmic cycles on the cosmic clock, 218 and multiplicity and beauty the One, 219 and the many out of the Beautiful One 220 by mirroring the image of Wisdom's God. 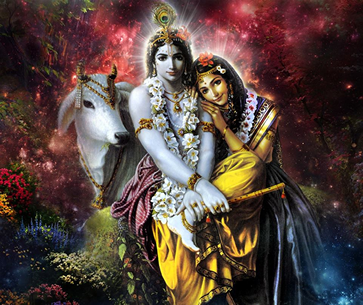 221 So, too, the Holy Spirit comes alive in the charming personages of Shiva and his Shakti. 222 Each one a sphere yet simultaneously a half of the other, 223 these divine complements of Love stand as living proof before all souls in Love that the opposite of Divine Love is not hatred but the balance, 224 whether of masculine or feminine charge, 225 of compassion, of kindness chastening with firmness, 226 giving and receiving gratitude as active and passive modes of the same verb, "to love." 227 The dual nature of Shiva, the Lord of Love, 228 himself the Destroyer/Deliverer, 229 is complemented by his consort who in manifold form is both demon slayer and child saver. 230 Parvati is the name of the benign "daughter of the mountain," the beneficent, gentle Mother and Wife. 231 The face of Durga8 is that of the fierce defender of her children, terrible and menacing to her enemies 232 the "Goddess Beyond Reach" 233 while Kali, another metamorphosis of Shiva's feminine nature, 234 represents the supreme night of the Mother that swallows up the grid of karma and the time/space worlds that contain it. 235 She complements Shiva's Power in the destruction, by Love, of the energy veil (illusion). 236 She is the Mother who lays down her life for the Cause of her consort and her children. 237 Her dread appearance is the symbol of her boundless Power. 238 Thus the spherical embodiment of Absolute Love by Cosmic Twin Flames consumes the forces of Absolute Evil in the form and personages of Anti-Love arrayed against It. 239 This force is embodied by the original betrayers of Love, 240 the fallen angels, who would, if they could, transfer it to Love's own. 241 Remember, then, always to differentiate between Love's self-contained pure polarity of Being and Love diametrically opposed by a force alien to and outside of Itself 242 and never make the mistake of confusing the two. 243 The law of perversion by misqualification of the original Principle in the practice of the black arts by adepts of the left-handed path, 244 we see, is all confused and mixed up with the adaptation of the Hegelian synthesis to the Communist world view. 245 In order for their theory to come out. 246 they must insert seeds of corruption in every thesis they desire to swallow up by the creation of a synthetic (trumped up) antithesis. 247 If Christ Truth be the premise of the abundant Life on earth, 248 the lie of anti-Christ as opposition to all that Christ Truth is and stands for will be set up as antithesis to tear down, break up, compromise, and destroy. 249 And the devil's delight is to hold up his red pajamas and say: 250 See me! See my way of merry mediocrity, 251 see my synthesis of two opposing systems that won't work without my intercession and expertise! 257 Its purity all consuming is its only response to every synthetic. 258 antithetical assailant of its Divinity untouchable. 259 And the divine alchemist knows the harmony of his elements and which admixture will cause explosion and injury to life. 260 which is the universal solvent and which will change base metals into gold 261 and how to heal the flaws of gem-stones, 262 and the gemstone of the heart. 263 For my thoughts are not your thoughts, neither are your ways my ways, saith the Lord. (Isaiah 55:8) 264 And the twain shall not be forced to meet by devils disguised in philosopher's robes 265 bearing their synthetic white stone and their compromise solution which shall be their own dissolution in the end. 268 "Lead me to the Rock that is higher than I," he implored. (Psalms 61:2) 269 Thus, contrary words of criticism and condemnation, words of harsh or hypocritical judgment 270 words of malintent 271 do not spontaneously spring forth from a heart such as his, 272 accustomed to attunement. 273 yea that lives and breathes mighty flame of Love. 274 Have we not heard as John heard, "He that loveth not his brother whom he hath seen, can he love God whom he hath not seen?" (1 John 4:20) maxim still speaks Truth when made to read, 275 you do not see God and sense his Love, you can truly love your brother." 276 So Christ commanded his own "that he who loveth God love his brother also." (I John 4:21) 277 Therefore let your own actions be your index to your attainment on this path of the third ray. 278 For they do speak. 279 And speak they shall, more than to thyself. 280 You see, the true Love that inspired the universes can be drawn only from God's heart, 281 center of all Being 282 the Great Source of (Power), Truth (Wisdom), and Love and every benign quality that springs therefrom. 283 I would say. then, that inasmuch as there is no other source for Love but God, and so many have for so long been "absent from the Lord," (2 Corinthians 5:6) 284 verily they have lost even the spiritual mechanism within themselves to understand that which they no longer possess. 289 products of fear and self-hatred. 290 But Perfect Love casts out all fear and all torment that fear begets. 291 And thy soul hath need to be infused with eternal Love by a mighty invocation 292 fervent in the Holy Spirit. 293 He that fears evidences that he is not yet made perfect in Love. (1 John 4:18) 294 He belies the fundamental principle of his relationship with God and, concomitantly, with his beloved twin flame. 297 Without faith in Love it is impossible for us to be pleased with ourselves or with any of our relationships, 298 all of which come under the canopy of the first fruits of our Love/trust with our Father/Mother God and our divine counterpart. 299 As Christ spake to his disciples: "Cast the net on the right side of the ship and ye shall find! "(John 21:6) 300 so let all who would manifest more Love recognize their need for greater attunement with Almighty Love through the record in heaven of the Father, the Word and his Holy Spirit; (1 John 5:7) 301 for even those who do not feel the mighty heartbeat of Universal Love and who have been unsuccessful in amplifying its release on behalf of all life upon earth can through the heavenly Trilogy correct their deficiency 302 which, I might add, is not to be taken lightly. 303 Unless you, alchemist of the sacred fire, 304 would-be adept of the mysteries, continually enkindle Love. 305 Love as compassion and kindness. 306 Love as tolerance and tactfulness, 307 Love as approbation and support, patience, long-suffering and forbearance, 308 Love as gratefulness and merciful forgiveness, 309 and actively expand it as a flame flower, 310 a many-splendored rose whose tender petals unfold all of these qualities and so many more 311 the law of balance as God's Justice will cause the Wisdom and Power aspects of the threefold flame 312 to be reduced to the lowest common denominator of your externalized Love plume. 313 I cannot honestly say that I marvel at the number of spiritual seekers who desire Power over themselves 314 for mastery 315 and over other parts of Life 316 for control 317 while ignoring the Great Law that requires man to express a true and lasting Love toward God and self and brother before he can possess both the Wisdom and the Power of that very Love which gave birth to the creation. 318 Remember that just as God cannot be invoked in part, the "unfed flame" 10 319 the fullness of the tripartite flame of Power, Wisdom and Love 320 must be invoked in its totality and completeness from the Father, the Son, and the Holy Spirit revealed by Jesus Christ. 321 For it is their focus of the Divine Whole, 322 the creative spark of God's desiring within you; 323 and no partial manifestation can generate the cutting action of the Whole that arrests Light's antithesis, 324 the Darkness that would clutch thee to itself 325 torment, enslave, and possess thy soul. 326 Only thy faithfulness to the Father and Son, 327 thy hopefulness and charity in the Spirit of the perpetual Helper, 328 will set free thy captive heart 329 and release both Light and spirit of the seeker from the dungeons of self-division and the divisive ones. 330 Thus, day unto day does the glory and power of God's kingdom 331 expand from within the threefold flame of the heartrarest of all immortelles. 332 We must acknowledge that there are many types of feelings which are called Love 333 but which, in Reality, are not. 334 In releasing our Trilogy here, 335 we slant our words not wholly to the advanced initiate 336 nor wholly to the beginner, 337 but to a median state where both shall derive the benefit. 338 Therefore, again, let us define Love. 339 As the worlds were framed by Love. 340 Love is both sagacious and potent; 341 for each part of the unfed flame is complementary to every other part and to the Whole. 342 Yet Love in essence is the very inmost being of God! 343 For Love in manifest action is God in manifest-ation! 344 "For God so loved the world, that he gave his only begotten Son. that whosoever believeth in him should not perish, but have everlasting Life." (John 3:16). 345 This Love of God to us is fully expressed in the gift of the Father's Presence with us, 346 in his gift of the Son whom we know 347 and love in Jesus Christ, 348 in the Emmanuel of our Christ Self 349 and in the gift of the Holy Spirit. 350 Everyone who loves is born of the Spirit (I John 4:7) 351 and finds Love's fulfillment in this Trinity 352 and in its expression in every part of Life. 353 Thus, it can be said and truly that he who loves not has not yet come unto Life, 354 for he knows neither self nor neighbour in the image and likeness of Love. 355 This God who is Love, 356 then, sent forth to us the divine spark. 357 the threefold flame whose threefold attributes of Power, Wisdom and Love 358 are all Love's kindling Light, the engrafting and engrafted Word (James 1:21) 359 that alone can raise us to the Source who is this Love beyond all Love expressed. 360 Truly, beloved. Love is the Lord's holiness with us. 361 And in his name we say. 362 HOLINESS UNTO THE LORD. (Exodus 28:36). 363 Love is penetrating and expansive; 364 Love is enfolding and transmutative; 365 Love is forgiveness and understanding. 366 Love is wisdom and strength. 367 Love is virtue and purity. 368 Love is dedication and constancy. 369 Love is all of the qualities of God combined with an added ingredient 370 not yet fully known to unascended man and woman 371 which, for many reasons. 372 we here can neither define nor unveil. 373 except to say that the fullness of Love is the very secret of Life! in the twig, that bent. That shapes the tree of life so straight and tall. As spires rise to clouded heights. The Power of Love's obedient Light. The diadem of Life, does shine. Its Grail-like motif making all divine. This Love's excelling mortal plans. And, gazing upward, sees the face of God. 375 John experienced the Truth he wrote, 376 that "he that dwelleth in Love dwelleth in God and God in him." (1 John 4:16). 377 Truly, beloved, this is the perfect equation of God in man and man in God the consummation of your Oneness in the Universal Christ. 378 But John also commented on your perfecting of this Love. 381 This judgment is the dividing of the way between the Real and the unreal within you 382 your restoration to Love's original premise. 383 But it is also the climactic cleaving asunder of Light and Darkness on apocalyptic scale by Love's two-edged sword. 384 Indeed! Armageddon is the day of your divine choosing to be your Real Self in the midst of the world wars of the gods. 385 Your boldness to proceed with this walk in Love's aloneness. 386 when all around you fools scatter and shatter Love's creation, 387 must be based on aeons of faith established through trust in Almighty Love. 388 To challenge the Adversary within and without fearlessly, in the defense of the unity of Love, 389 this is indeed the initiation that must precede, 390 as requirement, the alchemical marriage. 391 To pass it you need the intercession of Chamuel and Charity, the Lord's angels of Love. 392 And He shall send them to your side in answer to your call. 393 Divine Love, then, is the courage to defend Love against all enemies 394 and to know that Only Love (Alone), 395 and Love All-One, will sustain thee. 398 Now let us peer within the domain of the self of each individual, 399 e'en of thine own Self, 400 and perceive the meaning of Self-love. 401 And row by row we shall without fear separate the tares from the wheat 402 (and the tears as well) (Matthew[13:24-30]) and step by step in Love's own mastery you shall mount the spiral stairs of Love's degrees. 403 Selfish love is not Self-love. 404 That which see not that it may share with every other part of God's Life but that it may possess this Life unto itself, 405 holding people, things and ideas imprisoned in the domain of exclusivity, 406 is but selfish love. 407 This is the idolatrous adornment of the ego. 408 That which seeketh not its own but another's good, 409 drawing forth abundance that it may expand the glories of Life 410 and share them with the many, 11 411 is a manifestation of truest Love 412 This is true Self-love 413 the love of the True Self in all. 414 Self-love, or the love of the Real Self, does not generate disrespect or aloofness; 415 on the contrary, it regenerates man's faith in the inherent Good of all and teaches him, 416 even while admitting the possibility of human error, 417 that error is no part of the Real Self. 418 When human mistakes, which are but temporary recordings on the chart of man's experience, 419 are cleared by noble deeds and the violet flame. 420 and all inequities are righted by service to Divine Justice, 421 the fruit of unselfish action will manifest on an altar swept clean of all inordinate desire. 422 For the threshing floor of the heart made pure will provide a suitable altar upon which the unfed flame will more than flicker. 423 Its rising pulsations will expand in the rhythm of Life to elevate all whom it contacts, 424 commencing with the aspirant himself. 425 True Self-Love is the foundation of all other relationships. 426 Now. there are many forms of human love and these relate principally to man's contact with other parts of Life. 427 There is the love of father and mother for one another and their children. 428 and the love of the offspring for its parents. 429 The love of siblings, relatives, neighbors, 430 the servant and his lord, 431 the disciple and Master. 432 There is the love of angels, for the lowly 433 and of God for his highest creation. 434 There is the Love of the Guru and the One Sent for every chela of goodwill. 435 And there are chelas loving one another and the Guru positioned in every sector of cosmos 436 singing praises unto the God-free beings who rule the spheres. 437 And everywhere is Love unfolding the mysteries of Life. 438 Patterning and tilling in the pattern of the Whole of Love, 439 the Great Law has seen fit to charge the parents of this world with the responsibility for bringing into manifestation the children of the Most High 440 who represent the third point of the Life triad. 441 It follows, then, that maternal and paternal influences are destined, and were so intended, 442 to be divinely sponsored matrices. 443 The father person, representing the positive, masculine polarity of the Godhead, 444 has a wonderful and kingly responsibility for each offspring, 445 whereas the mother, who nurtures and guards the young child from the period of conception 446 through gestation and birth, 447 has a very close responsibility in bearing Wisdom's lotus flame throughout the life of the incoming child. 448 While we are on this subject, 449 it is my earnest wish to clear up for all time certain misconceptions concerning childbearing in the world of form 450 and the use of the vital and generative force by our sons and daughters on the Path. 451 First let me say that unless there be some lightbearers who are aware of the frightful opposition to high souls seeking birth on this planet, 452 who are willing in each era to offer themselves as vehicles for the incoming holy and advanced lifestreams, 453 it would prove most difficult for us to assist in giving them the proper training 454 from an early age which the Great Law requires in order for them to fulfill their mission to this darkened world 455 (although it is now somewhat lightening and en-lightening by devotees' decrees to the violet flame and thus soon-to-be recognized as freedom's star!). 456 In the name of heaven, beloved ones, the guarding of the body, mind, soul and energy levels of an incoming holy child is an awesome responsibility! 457 It is for this very reason that many desire to sponsor such holy children at inner levels and to act as their spiritual guardians, 458 some being themselves beyond the age of childbearing. 459 While they may elect to stand, as it were, as godfather or godmother for incoming lifestreams 460 a good and necessary service 461 let me point out that to the present hour the natural process of childbirth continues on earth: 462 and consequently there is a desperate need for dedicated fathers and mothers. 463 It is true that there are a number of studies being given attention at higher levels to alter the present system of giving birth, 464 to cause the entire process to be painless and more immaculate, raising earth's evolutions into a new Christ era. 465 Yet we must be most practical and admit to the Power of God's Love to flow forth through his embodied sons and daughters both to generate and to regenerate all life upon earth. 466 Now. you cannot deny, for all around you the evidence stands, 467 that side by side with the lightbearers the planet is filled with children who are obviously rebellious spirits. 468 Many of these have been released by the Lords of Karma to reembody in recent years, 469 some of them having been detained for a considerable period in the compound 12 (some since the sinking of Atlantis). 470 others having been held in special spheres of assistance in healing temples, awaiting rebirth. 471 The opportunities and restrictions governing the life of each incoming child are determined by their own karma 472 and reviewed by the Karmic Board to determine what dispensations of mercy may be granted. 473 Each soul receives the approval and seal of the Lord Maha Chohan and beloved Mother Mary prior to entering the etheric birth canal. 474 Remember, it is simply not possible for us to set aside cosmic law because someone knocking at the portals of birth deems himself wiser than he is. 475 Therefore the law will always act according to God's Justice both toward souls awaiting their turn for another opportunity to make things right on earth 476 andtoward those who pray for the opportunity to have them 477 as well as toward those who, 478 mutually bound by difficult karma, 479 have no choice but to play their parts and play them well. 480 The sacred use of God's vital energy for procreative purposes by those who wish to sponsor a family dedicated to constructive purposes is not only admirable but commendable. 487 Remember, dear ones, that at the time when an advanced soul comes into embodiment there is always a scene of parting at higher levels 488 and the full awareness that the mission of that one may or may not be successful. 489 When entering a veil of flesh, there is never any guarantee that that individual will not, 490 through some form of contention, 491 become involved in a karmic situation necessitating a round of unpleasant experiences. 492 Simply because an individual is highly evolved or a Christed one, as was beloved Jesus, does not insure against failure. 493 There is always a risk, the eventuality that one's friends who had intended to be his guardians and the guardians of his Light will betray that Light. 494 Then, too, there is the possibility that associates will misinterpret his motives, discount his good intents or ignorantly strive to force him from the ranks of God's service through impugning his character. 495 and in other regrettable manners fail to assist his holy purposes 496 through misunderstanding and indifference aggravated by the opposition of the sinister force. 497 Let all recognize that upon the earth body in this present hour there are children of Light and children of mammon. 498 Although Jesus said. "The children of this world are in their generation wiser than the children of Light," (Luke 16:8) 499 let all realize that the children of Light must become wiser than the children of mammon! 500 I do not deny that some of the children of mammon have behaved as children of Light and that some children of Light have behaved as children of mammon. 501 This does not prove that the law is wrong. 502 It simply proves the tenacity of the element of human discord, vanity, and sin on the one hand and on the other the Power of the Creator's inherent goodness that seeks to raise all life. 503 It also proves that laggard qualities are contagious and that vigilance is required to hold an immaculate concept regardless of what appearances may be involved 504 and to guard the heirs of the promises from the astral contagions of modern life and bad examples parading everywhere. 505 Certainly virtuous motherhood such as Mother Mary offered is yet the requirement of the hour! 506 Inasmuch as I am dealing here with interrelationships between people. 507 I want to point out that in the case of employer and employee, 508 there ought never to exist any form of slavery or tyranny. 513 Where the karma of twin flames does not allow their togetherness in a given life, 514 soul mates as partners on the Path brought together for a special service also provide the polarity for the cosmic wholeness to be nurtured on earth 515 in the complementary roles of Alpha and Omega. 520 And so, let the love of the individual parts for one another and for the Whole exceed self-love and excel unto an expansion of Love within the creation in honor of the Creator, 521 finding thereby reunion with one Life which is All and in all. 522 The great and awesome Power of creativity 523 that floods forth myriad and wondrous forms in nature and in man, 524 that creates cosmic beings and angel messengers of fire. 525 holds in cosmic Mind the Truth that a love not wholly integrated with the allness of the cosmos 526 in the oneness thereof would not be God, would not be Good. 528 Inasmuch as Goodness requires some objective manifestation of itself in order to love, 529 the great creative will of God was and is to create many Self-expressions in form: 530 the wondrous design of twin flames descending from the Sun to unveil in flesh the faces of Alpha and Omega 531 in so many ways: sons and daughters of the Most High, 532 children of the One basking in the Love play of angels and elementals, 533 guarded by nature spirits, 534 luminous presences and mighty beings of the Elohimic spheres, 535 all in one grand hierarchical order, 536 that each one, 537 from an electron to a star, 538 might, in receiving his Love, return that Love not only to the Central Sun and the Creator 539 but also to all creatures he has made. 540 dwelling now in the peripheral worlds of time and space. 541 Few have reached the level of Saint Francis of Assisi13 in their comprehension of this concept concerning the multifaceted parts of the one individed Whole. 542 I would, therefore, call to your attention the great depth of compassion and the true scientific understanding of the psychology of the soul, 543 far in advance of his time. 544 which your blessed Koot Hoomi externalized in his embodiment as dear Francis 545 and which remain to the present hour in his ascended state the outstanding qualities of his service with beloved Jesus in the office of World Teacher. 548 Compassed the sea, the sky, and all. 552 And hopes did rise like bird on wing. 553 O Love, thy flame shall bear one yet on high! 556 Of God's own fiery beating heart! 558 I feel the power of Truth till me. 560 Is this great truth: That I AM Thou! 561 How great was his example! 562 Yet, the great example need not be anyone with whom you are familiar. 563 or it may be anyone with whom you are familiar. 564 In the history of Christendom the great example finds its purest form and expression in the figure and divinely human personality of Jesus. 565 And yet I do not blaspheme when I say that many men and women in embodiment today have, through their devotion to Jesus and to the great God Self, 566 received the same sacred love tokens from God's heart that the Almighty imparted unto Jesus. 567 The dove of the Holy Spirit has rested upon their heads 568 and its snow-white radiance of purity has flowed from their hearts. 572 Some have founded no new religion, 573 all have supported holy endeavors and sought to be examples of God's purity. 574 Over the centuries mature sons and daughters of God of considerable accomplishment in many fields 575 prophets, teachers, reformers and not a few great lights 576 have brightened the planetary corner with their Presence. 577 And by their balanced expression and generous sharing of their developed threefold flame 578 to which the Saviour by his grace has added his momentum 579 they have been wayshowers of the path of individual Christhood ordained by God 580 not for one son alone but for all heirs of His Light. 581 For unto all who believe in the reality of the Christ-flame in Jesus, the Master has the Power to make them 582 by Love's enkindling Power, 583 by the engrafting of the Word 584 to make them. I say, more the Son of God. 585 Thus it is written (John 1:12) and thus the Ascended Master Jesus Christ initiates his disciples today by the heart-to-heart impartation of his flame unto those who work his Works and embody his Word. 586 I would, therefore, offer this plaudit on their behalf, 587 this acknowledgment in Freedom's name that the world is not so poor as it sometimes considers itself to be in the manifestation of this great God-essence of Love 588 but that it already possesses a great wealth of divine Love 589 a Love all too often unrecognized even when seen! 590 a Love that commemorates Jesus' devotion to his fold 591 and upholds the standard he set for those who would follow him in deed. 597 This Love, as Life's essential ingredient, 598 flows not only from God on high to the hearts of known and unknown manifestations of himself below, 599 but also from holy men and women in embodiment. 600 whose Love as devotion and service 601 to every part of God's Life becomes day by day 602 more like unto the Father and the Son in their mutual adoration. 603 Man's penetration of the holy substance of God's essential Love provides him, 604 through the power of the Maha Chohan, 605 with an infusion of that elan which makes the world go round. 609 Those hearts and many of them yearn to know the Truth and to be free (John 8:32) 610 who pursue a dyed-in-the-wool path 611 of their own misguided wills and spew out hatred against men of goodwill 612 whom they do not understand, 613 do indeed place their feet in ruts of stumbling upon the mountain of attainment. 614 And although the great connecting link, 615 the lifeline from on high, 616 as a giant skein of Light and Life dropped down to earth, 617 continually pulls man forward, 618 the traction created by the pulling back of these people 619 (the recalcitrance of a stiff-necked generation), 620 compounded by the sheer weight of their numbers exercising free will in opposition to (as the antithesis of) 621 the Divine, 622 does in effect prevent the universal manifestation of God's kingdom upon earth! 623 In the holy name of Love we would speak a practical manner on the great need for keeping and maintaining one's personal harmony 624 not on in one's feelings but also in one's thoughts. 625 For harmony is not only the Law of Love, it is the epitome of Love, 626 the sign of Love's true conquering heroes. 627 Now, as many of you know, when the thought desires to go to the right and the feelings pull to the left, 628 most often it is the feelings that win out 629 and the thought, by rationalization, 630 will gravitate in their direction. 631 And in many cases, unless, of course, the feelings are motivated by purest Love, 632 this is not the fulfillment of the law of harmony rather it is very often a compromise made by the soul caught between the mental and feeling worlds. 633 And it can result in that peace without honor which, 634 because it is not based on Principle, 635 cannot provide the permanent solution to the problem. 636 In all his noble efforts to precipitate substance alchemically, 637 man will find no higher alchemical key than the purity of divine Love flowing forth from his consciousness as God's thoughts and feelings 638 winged messengers of Light delivering blessings, 639 attracting more of their kind 640 and returning to the alchemist the blessings of the abundant Life. 641 The Love of God made manifest in the three-fold flame scintillates with immortal brilliance. 642 Its vibrant, radiant, all-enfolding Light comprises the sun flame centers of all interrelated macrocosmic/microcosmic energy systems in material and spiritual manifestation. 643 Withdraw the Power Love from any of these and their eventual collapse is certain. 644 Every system of worlds, planetary or starry body that has ever been dissolved, whatever apparent or scientific reason, has collapsed from within due to the withdrawal of the Love charge from the sun center. 645 The lapse from the moment of withdrawal to the moment of dissolution range from thousands to even millions of years as men reckon time; 646 or it may consist of a few microseconds 647 or the pause between them. 648 But the decay of every system begins with the withdrawal of Love's "lodestone' from its center. 649 Love, then is truly the cohesive Power of the universe. 650 One of the most dreaded diseases upon earth today14 manifests as a result of mankind's hatred toward one another, which, when it returns to sender, 651 drives the Love element from the cells, thereby causing a perversion of their functions. 652 Through invasion and metastasis, 653 the disease eventually spreads throughout the body; 654 death ensues when the form. 655 whose cells have lost the cohesive power of Love, 656 can no longer magnetize enough light to sustain the bodily functions. 657 Though the cause may be ancient. 658 having lain dormant for lifetimes, 659 the karma comes due. 660 Only flood tides of Love and oceans of violet flame can bring permanent resolution 661 to the festering hatred that lodges in the psyche of man. 662 Yet to this day some have vowed to world karma in their members. 663 Saints with blemish are these who take into their bodies the world sin of human hatred. 664 Thus, judge not the infirm, but help them! uphold them! heal them! By Love. 665 In healing the many types of cancer and other physical, mental, or emotional disorders, 666 the invocation to divine Love is essential. 667 And the healer must be all Love in action. 673 The Master's healing of the woman who touched his garment 674 without his knowledge was example of the impersonal action of divine Love. 675 His response, "Who touched me? for I perceive that Light hath passed from me to her ...," 676 owed that the Impersonal Christ had healed her through him without his foreknowledge. (Mark 5:25-34) (Luke 8:43-48). 677 Divine Love as the living Christ, 678 the Son behind every son of man, 679 is both personal and impersonal; 680 and it is fulfilled measure for measure, 681 as ye are able, in every one of you through the cycles of the law of your Being, 682 the law that is ever Love in manifestation. 683 When you exercise it, 684 the Law of Love unites the purity of justice, mercy, and freedom in perfect balance through the threefold flame within your heart. 687 In closing this Trilogy, then. I say unto all let not selfish love carry you into the byways of delusion, 688 far and apart from your brothers and sisters and those other parts of Life whom God has made. 689 Remember, too. that those who have chosen to embody elements of evil ever seek to divide the children of the Light 690 by subtlety, flattery, hypocrisy, money schemes, sexual entanglements, etc. you yourself can name the rest; 691 whereas true Love would unify the sons and daughter of God in the very essence of holiness and world service. 692 To pay tribute to Love is to pay tribute to the great drawing Power of God's own tripartite flame. 693 Love is God's flame of Being in manifestation. 694 One day the scientists of the world, 695 through special instruments, will be able to measure a portion of the Love flame 696 and its radiant energy but never will an instrument be made that has a scale great enough to measure the all-encompassing Power of infinite Love. 697 Infinite Love can best be expressed as the manifestation of God. 698 The manifestation of God can occur in everyone. 699 It is the destiny of man that shakes from man his dust. 700 Love, then, is the fullness of God as he manifests man. 701 I tell you there is no limit to the degree of God's Love which anyone who will may manifest. 702 Anyone who wills to invoke it, to be it, and to share it may be the answer to Love's call and calling. 703 Here in the realm of divine Love is the City of God, 704 the foursquare city described by beloved John (Revelation 21:9) as the place of conscious attainment where the fullness of your aspirations may find unhampered expression. 705 Here your soul looks out upon the great wide-open spaces of the creation. 706 Love has unlimited new worlds to conquer. 707 Love is the Promised Land where the strength of the lion's nature is given to the heart of the lamb, 708 and the Good Shepherd of the Eternal Covenant seals all in the victory of the expanding Three-in-One Flame of God-Good, 709 worlds without end. 710 For thine is the Kingdom 711 the consciousness of God, 712 his Wisdom: thine is the Power 713 the unlimited, inexhaustible strength to be and to fulfill your fiery destiny; 714 and thine is the Glory 715 the crowing Light of Loves diadem of perfection 716 forever and forever. 717 Amen. 718 Thy God hath willed it so. 719 I AM faithfully in Freedoms cause and service. 24.2. How are connected Power, Wisdom and Love, regarding God? 24.3. 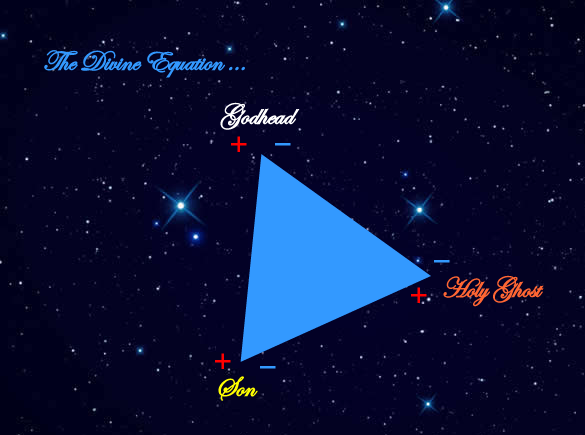 What is the Divine Equation? 24.4. What are the three elements of German philosopher Georg Hegel? 24.5. Who apply the Hegel dialectic to "dialectical materialism? Works? 24.6. How Hegelian dialectic relates Power, Wisdom and Love? 24.7. Will Communism works in some place in some time? 24.8. Are Love, Wisdom and Power divided or they are indivisible? 24.9. What are the Four Cosmic Force? 24.10. How is defined T'ai-Chi? 24.11. What are Brahma/Vishnu/Shiva in the Christian Tradition?... for Real before the Throne of God? 24.12. What is the Perfect Equation of God in man and man in God? 24.13. Was possible that John (who wrote the Gospels) challenge the Anti-Christ? 24.14. What is Armageddon in the very words of Saint Germain? 24.15. Are there Gods of Darkness? 24.16. What is Divine Love? 24.17. Is Selfish Love ... Love? 24.18. Are there in embodiment Children of Mammon? 24.19. Are there Twin Flames? 24.20. Are to-day many man and woman like Christ? Many Christ? As Lord Jesus? 24.21. What Biblical passage recount the Woman that touch the Jesus garment and was healed? 24.22. Who can represent Mother Mary in the Hinduism Tradition? 1 those who follow the Will of God. which clothes are generally Blue..
2 The Logos, plural of Logo represent. The Living Word, that dwell in Paradise. Saint Germain ask them for permission to return to Earth. They are both Alive Beings and Divinities. 4 Hari is a name as well a stale of consciousness. Lord Jesus Calm, Warm, Holy, Reflexive, Splendorous without Judgment Is the Best example. 6 Purusa means Cosmic Man. 8 Durga is the Multi-hands Goddess. 9 See The Magic Presence, available also in Spanish. 10 like the Maxim Light of Atlantis, unfed but perpetually burning but unfed by any human source. 11 The Multiplication of Bread and Fishes by Lord Jesus before 5000 persons. (Matthew 6:33-52). 13 The Beloved Koot Hoomi. actual Chohan of the Third Ray of Love, was Saint Francis, as well the Great Pythagoras in Crotone. and the architect of Taj Mahal in India, King and Pharaoh in Egypt. See Corona Class Lessons. 14 Saint Germain is talking about Cancer disease.